So the whole Tour comes down to today's TT. Silence-Lotto's Cadel Evans needs 1:34 to overtake yellow jersey Carlos Sastre for the race lead. Sastre will have the advantage of starting last and the mythic power of the maillot jaune on his side. The battle's not only for the top spot today. Bernhard Kohl, Denis Menchov, Fränk Schleck, and Christian Vande Velde all hold hopes of making the podium, and will burn their last matches to try to get there today. It's a pity they can't borrow matches from Wim Vansevenant and Bernhard Eisel, locked in a struggle to be the lanterne rouge of this year's Tour. 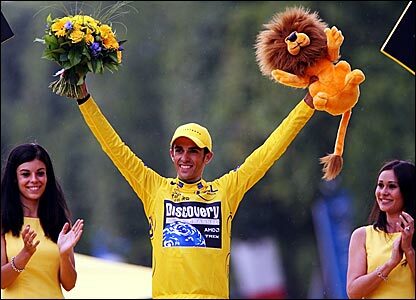 Vansevenant was last-placed overall in the 2006 and 2007 Tours, and can become the first man ever to finish last in three Tours. Vansevenant took advantage of starting second on the TT and rolled in 2:00 behind Eisel to retake the cellar. They also discussed the overall podium: Roll wouldn't commit on placings, but tipped Menchov, Sastre, and Evans as the podium. Sherwen picks Sastre to win, Evans second, then Vande Velde; Liggett and Hummer both say Evans, then Sastre, then Menchov. Danny Pate of Garmin-Chipotle was an early leader, finishing in 1:06:45, but his teammate David Millar and world TT champion Fabian Cancellara are on the road now, beating Pate's time at each Time Check. At the finish, it's David Millar in 1:05:27, and Cancellara coming just behind, looks like he's got time to take the lead; he comes in with a 1:04:11.88! There are a lot of strong riders left to ride, but that's an impressive time that could easily take the day. Out on course, Stefan Schumacher, who won Stage 4's 29-km time trial, equals Cancellara at TC1, loses 12 seconds at TC2, but finishes in 1:03:50.48. That's going to be tough to beat. Vande Velde hits TC1 with the 4th best time, a 21:58. Menchov is next, it's a 21:52. Evans is coming , and puts up a 22:08. He's got a little more than a minute on Menchov on GC, but he's already lost 16 seconds of that. Now Bernhard Kohl comes through in a 22:06. Things are looking tight! Andy Schleck was caught by Bernhard Kohl, who started 3 minutes behind him, but held off Roman Kreuziger to hold on to his white jersey. Cadel Evans never was able to put serious time into Carlos Sastre, finishing in 1:05:56. 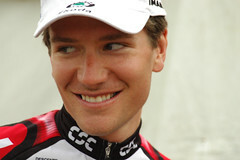 Sastre, for his part, reeled in teammate Fränk Schleck on the road, limiting his losses to Evans to only about 30 seconds, and Carlos Sastre and CSC will take the 2008 Tour de France. As always, you can follow these updates and more at my Twitter feed. 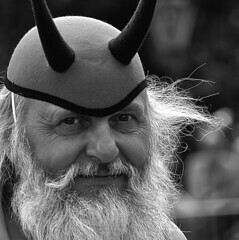 Graham Watson again offers prints of every photo in his current Tour gallery -- this is a great chance to get a print of a favorite rider competing in the London Grand Depart. BBC London is collecting pictures from the public, and here's the collection from yesterday. Quality is not great -- there are several better Flickr photosets -- but there are some fun pictures in here. With the Tour a little more than a week away, most of the European countries are holding their time trial championships, with road nationals this weekend. 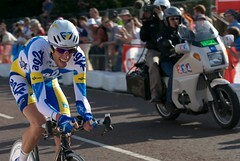 Sweden: Gustav Larsson won the TT title ahead of TdFblog favorite Magnus Backstedt, with Thomas Lövkvist 8th. France: Benoit Vaugrenard of Française des Jeux won the French time trial championship today, ahead of Dimitri Champion and Nicolas Vogondy. 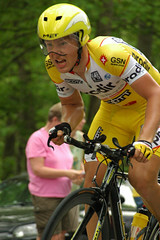 Last year's winner, Sylvain Chavanel, did not compete. Switzerland: Fabian Cancellara showed why he wears those rainbow stripes, earning his 5th Swiss national title. Italy: Luca Ascani of Aurum Hotels beat out '05 TT champ Marco Pinotti and Vincenzo Nibali to earn a maglia tricolore. Germany: Former Phonak Bert Grabsch beat out Lars Teutenberg and Robert Bartko in Warnemünde on Sunday, while many of Germany's top TT men competed at the Tour de Suisse. Caisse d'Epargne's Vladimir Karpets emerged victorious from the Tour of Vladimirs, as his teammate and former race leader Vladimir Efimkin faded in the time trial at the Tour of Switzerland Sunday. CSC's Fabian Cancellara looks like a pretty good bet for the Tour de France prologue in London, as he took the day's 33.7-km time trial by 20 seconds ahead of Astana's Andreas Klöden. Cancellara also took the Swiss prologue, but Sunday was sweeter, coming in Bern, his hometown. Gerolsteiner's Stefan Schumacher was 3rd on the day, at :33, ahead of Discovery's Stijn Devolder at 1:04, Discovery's Vladimir Gusev, who won Stage 7, at 1:05, and Karpets 6th at 1:06. Efimkin could manage only 38th, dropping 3:22 to Cancellara. Frank Schleck had promised to go all out to take the race lead, but he fell to 7th overall with a 29th-place finish on the day, 2:50 back. Levi Leipheimer stamped his seal on the Tour of California with a dominant performance in today's 14.6 mile/23.5 kilometer time trial. Leipheimer put another 18 seconds into Jens Voigt, who was 2nd-fastest on the day, and Discovery Channel teammate Jason McCartney was 3rd on the day, almost 25 seconds behind Leipheimer. Discovery Channel and Team CSC dominated the day, taking 9 of the top 10 places. The sole interloper was Priority Health's Ben Jacques-Maynes, who was 3rd in the race's prologue on Sunday. World time-trial champion Fabian Cancellara could manage only 4th on the day. Leipheimer, who had a very disappointing time trial in last year's Tour de France, partially credited the win to a change in his position discovered during an off-season wind tunnel session. The results were enough to bump Rabobank's Robert Gesink ahead of Predictor-Lotto's Matthew Lloyd in the young rider's competition. All four race jerseys (overall, mountains, points, and young rider) are still in play, with the climber's jersey to be decided on Saturday. Jason Donald of Team Slipstream (formerly TIAA-CREF) shocked the field with a 4:50.497 on the course up to Coit Tower. Donald was 7th to start the prologue, and as the riders got more and more established, nobody could top his early time. Discovery Channel's George Hincapie rode a 4:57 and change, US time trial champion Dave Zabriskie finished in 4:59.169, and even current world time-trial champion Fabian Cancellara could manage only 4:55.098. 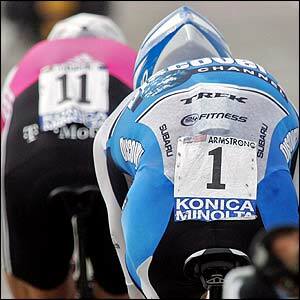 The last man to go was Levi Leipheimer, who won the inaugural Tour of California prologue last year, but in 4:53. Riding this year as the leader of Discovery Channel's squad, Leipheimer streaked through the course in 4:49.050, to take the first leader's jersey of the race. He'll wear it into his hometown, Santa Rosa, during tomorrow's stage. Jason Donald, 2nd on the day, is a climbing specialist out of Colorado, and had Phil Liggett doubting the race timekeepers during the broadcast. 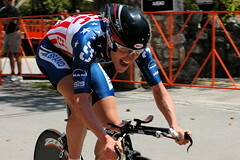 His 2 previous wins were a stage at the Tour of the Gila and the Colorado state criterium championship. Priority Health-Bissel's Ben Jacques-Maynes rounds out the podium. A few surprises in the European national championships, as 32-year-old former Telekom pro Dirk Muller took the German title, and Spain called the whole thing off. 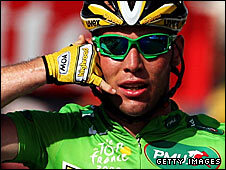 Riders in bold are provisional 2006 Tour de France starters. CSC's Paris-Roubaix winner, Fabian Cancellara, was a surprise omission from Bjarne Riis's Tour squad. Cancellara says he had structured his season around a possible repeat of his 2004 prologue victory, and is dejected that he won't be among the team's riders looking to give Ivan Basso his first Tour de France title. Andrew Hood at VeloNews talked to Bjarne Riis about the decision, and Riis said he decided at the last minute to take Tour of Luxembourg winner Christian Vande Velde in place of Cancellara. Riis also cited the lack of a team time trial in this year's Tour in his decision. The final stage of the Tour of Switzerland is underway; it's an up-and-down 30 kilometers from Kerzera to Bern. Jan Ullrich lurks in 3rd, only 50 seconds behind yellow jersey Koldo Gil. He's the favorite to win the stage and the tour. Early leader is CSC's Fabian Cancellara in 40:11.31. T-Mobile's Michael Rogers is 2nd at 40:36. Liquigas' Stefano Garzelli comes in in 40:22 to move into 2nd, so far. His teammate Michael Albasini will finish with both the climbers' and points jersey for the Tour de Suisse, and both are on the just-named Liquigas Tour squad. CSC is firing on all cylinders. Their Fabian Cancellara took the first stage in the Tour of Catalonia today. Echoing his prologue win in the 2004 Tour de France, Cancellara finished the 12.5-km time trial in 14:55, 3 seconds faster than Illes Balears' Vladimir Karpets, Discovery Channel's Janez Brajkovic, and Phonak's Robbie Hunter. "My entire Tour will be less than 10km. After that, I will do my all to help Ivan win," Cancellara said. "After that, I still have goals. I'd like to win the world (time trial) title in Austria." Christian Vandevelde was 8th on the day, Levi Leipheimer 13th, and Cadel Evans 20th. Team CSC has announced the Tour of California squad, and it's loaded with Tour de France veterans, including 2 of last year's yellow jersey wearers. New CSC riders Fabian Cancellara, Stuart O'Grady, and Karsten Kroon join Americans Bobby Julich, Christian Vande Velde, and Dave Zabriskie. Rounding out the eight-man squad are Jens Voigt and Lars Bak. Voigt and Zabriskie both held the yellow jersey during last year's Tour, the only riders not named Armstrong to spend time in the maillot jaune. The first Tour of California kicks off Sunday with a prologue in San Francisco. T-Mobile's Alexandre Vinokourov put on an awesome show of force on Sunday, outriding half the field to take the Tour's final stage in Paris. Breaking away on the last lap of the day, Vinokourov managed to gap and hold a gap to the teams trying to set up their sprinters: Cofidis, Davitamon-Lotto, Liberty Seguros, and FdJeux. Joined by Fabian Cancellara, then by Française des Jeux's Bradley McGee, Vinokourov put his head down, and countered an attack by McGee to take the stage. Lance Armstrong, of course, nails down his 7th overall victory in the Tour, and took the podium flanked by his 3 children. He also spoke to the crowd (and TV audience) from the podium, an unprecedented act for the Tour winner. After some debate, judges awarded bonus time to Vinokourov for the stage victory, which lifted him into 5th overall on the Tour and dropped Levi Leipheimer down to 6th. Credit Agricole's Thor Hushovd of Norway nailed down the green jersey competition. Oscar Pereiro was named the most combative rider of the Tour. T-Mobile took the team competition, along with 3 stage wins. 3) Fabian Cancellara, Fassa Bortolo, s.t. 4) Robbie McEwen, Davitamon-Lotto, s.t. 5) Stuart O’Grady, Cofidis, s.t. 6) Allan Davis, Liberty Seguros, s.t. 8) Baden Cooke, Française des Jeux, s.t. 10) Robert Forster, Gerolsteiner, s.t. Aussies in 2nd, 4th, 5th, 6th, and 8th on the day. Compared to last year's final GC, Pereiro is 10th again, Leipheimer climbs from 9th to 6th, Mancebo improves from 6th to 4th, Ullrich goes from 4th to 3rd, and Basso improves from 3rd to 2nd. New names in the Top 10 this year are Vinokourov, who will certainly keep things interesting wherever he winds up next year; Rasmussen, who owned the big mountains; Evans, who had an excellent 1st Tour at 8th; and Landis, who I felt rode a very defensive Tour, and was never really able to take the attack to the leaders. Some jersey swaps tonight, as Thomas Voeckler will be the first man to wear the polka-dot jersey, Tom Boonen will put on the green jersey (and Boonen has a much better chance of finishing with his), and Sylvain Calzati of AG2R will ride tomorrow with the red race numbers of the most aggressive rider, for his part in today's suicide break. Even more bad news for Jan Ullrich: He held position near the front of the field today at the finish, and a time gap opened, but judges eventually ruled the gap was caused by the crash, and gave riders on both sides of the gap the same time. That's why you may see Ullrich in 8th at some websites. Keep your eyes peeled for updates at DaveZabriskie.com — Z is pretty funny. Graham Watson is the premier cycling photographer working today. He's writing a daily column at Chris Brewer's ThePaceline.com (free registration required), as well. During the Giro, he was providing on-demand prints for sale, so that you could order up-to-poster sized prints of his shots the day they were taken. I'm hoping that will return for the Tour. The first thing was total disbelief ... that Postal Service wouldn't sign David Zabriskie. I was blown away and I had to ask (Riis), are you sure that he's available? Absolutely, 100 percent this is the guy you want because by far he is the top American talent under the age of 25. 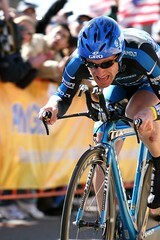 Zabriskie, who switched to CSC after riding for U.S. Postal until last year, credited his former squad, saying his years there were "good" and that they "were development years that helped me progress as a rider. They gave me a start and a lot of experience." I heard Bob Roll say Zabriskie would wear the white jersey, but he was born in 1979, so he's a few months too old for that competition. Jersey roundup: Zabriskie does hold yellow and green, there were no climbing points awarded, CSC leads Discovery in team rankings (by 4 seconds! ), and Fabian Cancellara of Fassa Bortolo takes the white jersey. Your first lanterne rouge is Saunier Duval-Prodir's Leonardo Piepoli, who won't hold that distinction once we hit the mountains. Somehow, he finished 4:40 back of Zabriskie; the next slowest rider, Domina Vacanze's Rafael Nuritdinov, was at 3:50 on the day. Iban Mayo, whose form was considered something of a mystery, cleared everything up today, finishing 175th of 189. He's already 3:14 back of Zabriskie. 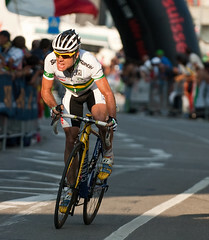 Robbie McEwen won the Australian national championships back in January. It may be more surprising what jerseys aren't going to be there: Belgium (Serge Baguet), Italy (Enrico Gasparotto), Germany (18-year-old Gerald Ciolek, breaking T-Mobile's 12-year stream of German champions), Russia (Sergei Ivanov), and Norway (Morten Christiansen). I'm probably overlooking a couple (Luxembourg?) -- please post additional national champs.